Hi everyone and welcome to a new article written by the boss! First, let me introduce the Outrun Original Soundtrack. This has been taken from the Outrun 20th Anniversary Box which is an AWESOME box which includes a whooping 11 Discs of pure retro soundtrack bliss! Each CD has the soundtrack of a certain version of Outrun (ie: Outrun, Outrunners, Outrun 2, etc…) played with either the arcade machine or the consoles it was ported on. 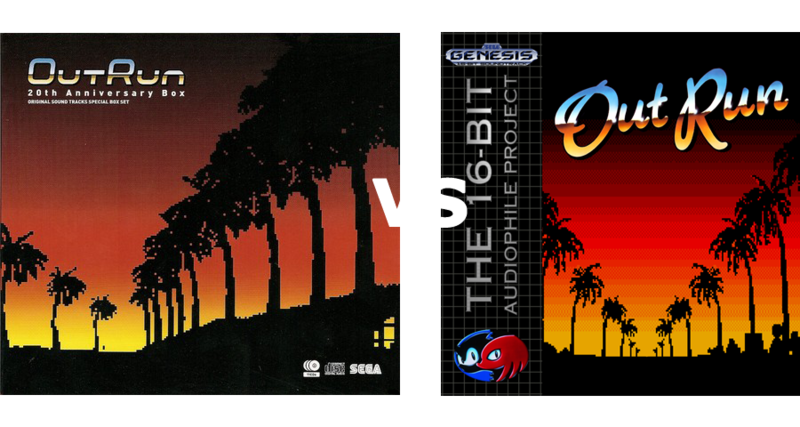 For this comparison, I’ve used the sixth CD which has the Mega Drive/Genesis version of both Outrun and Outrunners. Now, for those who do not want to read the entire article I’ll say this here: despite me being as objective as possible and considering every single aspect of both these soundtracks this comparison been a stomp. Our release is way superior in all but one aspect compared to the OST. This said, let’s get started! What the heck is the “DR Value”?? The DR Value is a unit to measure the Dynamic Range of a track. I won’t go deep in technical explanation but the higher this value is, the more dynamic and “lively” a track sounds, hence higher is better. More info here and here. To best describe the difference between those two I’ll make a comparison using an experience more or less everyone had. Do you remember when you bought your first cheap chinese MP3 player that came with that horrible uncomfortable ear buds? You’ll probably remember how thin and metallic the sound was, unnatural and cold. Next you’ve probably switched to a quality MP3 player like an iPod, Sansa Clip or some of the better Creative players which came with better sounding headphones too. You probably had an epiphany playing your first track on it when you realized how much you’ve been missing using an el-cheapo MP3 player: now everything sounds fuller, meatier and less fatiguing. That’s the comparison between the two tracks. The OST sounds like it’s been played on a little plastic radio: thin sounding, bright and it has quite a bit of white noise in it. On some passages towards mid track high frequencies become piercing and shrilling (and distorted in certain points as well). Ours, on the other hand, seems played on a proper hi-fi system: the sound is warm, full and sweet to the ears, non-fatiguing. The bass is ever present but not invasive and you can easily recognize each single instrument. It also has a darker sound signature – which doesn’t mean that the highs are rolled off or cut, but the entire signature of the track is a bit close-sounding compared to the OST. The only part where the OST has the upper hand is in high frequencies which are more prominent compared to ours but everything else just falls short. Also, despite this deficiency, our release sounds more lively. Passing Breeze is a “lighter” track which has a weaker bass line, therefore the track is balanced more towards middle-high frequencies, thus penalizing one of our stronger points. We can apply everything said above and even take a step further about the OST: on certain parts of Passing Breeze the sounds becomes shrilling to a point of almost causing headaches, quickly becoming too fatiguing for my own tastes. Better keep the volume down a couple of notches. As said before, our release have a darker signature which tends somewhat to smooth out those parts and making them more enjoyable enabling us to blast this calm track at higher volumes for pure retro bliss. Again, our release sounds definitely more lively than the OST, more dynamic. This used to be the track I always chose when I used to play Outrun at the arcade. Story repeats itself once more here so I won’t be describing much more. Being an aggressive, fast track, the OST’s more aggressive and open sound signature does a good job here despite being a bit fatiguing on certain passages. Since its bass is more dry and compressed compared to our release the entire track sounds somewhat more agile here, faster, which goes well with the music. Again, our release sounds more smooth but maybe a tad less enjoyable when compared to the OST even though it just stomps on every other parameter as usual. Here comes the complete stomp, where the OST just goes hiding in a dark corner. This track is very groovy and the bass line is well present throughout the track making it a very important part of the music. The OST just doesn’t have the quantity of slam our release has and even the high frequency compartment is absolutely inadequate as the trumpets/synthesizers are way too evident and separated from the rest of the instruments. There’s not much else to say here, really, there’s nothing saving the OST in this head to head. This one really comes down to each own preferences. This is a super smooth, relaxing track without much going on. Our release has a bit more presence and sounds a tad more full with a warmer sound but that’s really it. How can there be so much difference between those two??? This is something that really bugs me a big deal. The differences doesn’t stop just at the OST being more open sounded and airy, there are also little details that are different from our tracks. One possible explanation is that SEGA used a PC-88 (a NEC Computer which has a very similar and supposedly higher specced Yamaha Sound Chip than the Mega Drive/Genesis) to playback the tracks and that would explain everything. Another hypothesis is that they used an unmodded Mega Drive 2 which had terrible, terrible audio circuitry with many errors in it which, among everything else, caused the PSG-1 chip to sound too loud. Many people tend to forget that our goals, besides recording the tracks with the highest quality possible, is 100% accuracy towards the original hardware. 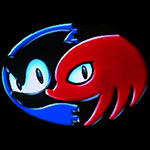 I’ve double checked my Mega Drive to see if I made any error in one of the little mods I’ve done but everything is ok, which is also confirmed by the frequency spectrum of the tracks seeing that the high frequency extends quite far. This further confirmed that we’re ripping games with absolute accuracy. The other thing that really upsets me is the high quantity of white noise present among the high frequencies in the OST… did they boost the treble on purpose? This would also explain why there are some points where the treble becomes distorted (more noticeable on Magic Sound Shower). Many, many questions that we’ll probably never have an answer for. If you crave for a more aggressive, open and airy sound signature and can withstand lots of treble (or your system is a bit shy on treble, it would fix that as well), you may want to give the Outrun OST a go and see how you like it. If you’re already accustomed to a more “hi-fi” sound and generally a darker sound signature, you’ll probably want to go with our release and you’ll not be disappointed. I really want to stress that everyone has different tastes when speaking of sound signatures: there are the so-called “bass heads” which care only for bass extension and presence and are not concerned with it bloating over the mid frequencies and covering other instruments; there are those craving for crystalline highs and don’t care about it being fatiguing over time and so on. This is strictly my point of view and follows my own tastes, so your mileage may vary. I hope you’ve enjoyed the read and I encourage you to come over to our Forum and comment and share your ideas and experience! UPDATE: can confirm, they used hardware based off the YM3438 which is the crappy sound chip used in later Model 1s and most of the Model 2s. This also explains the presence of white noise.